Saying Good-Bye to Thursday and Hello Friday – When Will We Cry? As we were packing and preparing to head back to the city Thursday night we received some bad news. 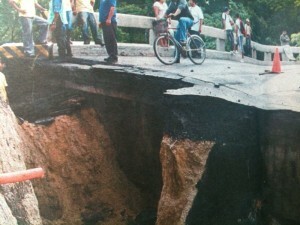 The bridge at Retalhuleu had washed out earlier that day. Perhaps it was partially damaged during the tropical storm a few weeks ago and now the continued heavy rains finished it off. Our concern now was getting the team back in time to catch their flight on Saturday. The Pan-American Highway runs through Retahuleu about half way back to the city. Ely knew a way around the town but it was questionable whether or not the road would be passable by van. Our only other option was to drive through the mountains. This would add at least 3 hours to our trip. Either way we knew our journey back to the city might be eventful so we decided to leave Piedra Partida at 5a on Friday morning. At 7a, about two hours into our trip, we learned that the road around Retaluhelu was only passable by 4X4. Our final option was to go through the mountains. The roads were good but there was still much clean up being done due to the recent mud slide in the area. As always the mountains were very beautiful. 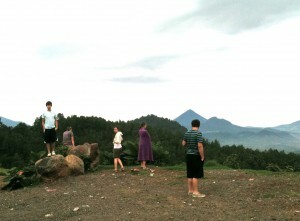 Some of the team members stretched their legs and enjoyed the fresh mountain air. Even though the trip was long everything had gone well and it did look like we were all going to get to reach the city at a decent hour. As we made our way down off the mountains we entered into the city of Chimaltanego, around 5000 feet above sea level and it was 2 more hours to the city. 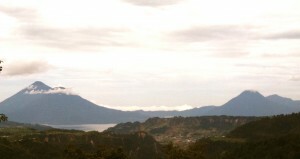 We were almost close enough to smell Guatemala City and I breathed a sigh of relief. With my next breath and without warning traffic came to an abrupt stop. Soon, horns began to blow and impatient drivers started making their own way forward. I have seen this many times before and usually it ends in a horrific traffic jam. I call it the Guatemalan version of a “Mexican Stand Off.” We learned that a sink hole had swallowed half of the road ahead and detours were set up.